3D or three dimensional arts is one of the oldest forms of artwork. It was first done by artists of artists of 15th century to decorate the house and buildings of wealthy people. Since then 3D became widely popular form of art, not only for entertainment but also for branding and advertisement. A number of designers and painters are now trying to excel in this form of art because of its popularity, while some have emerged with some outclass designs. So today I thought of sharing some of these designs with my readers too. Showcasing below is a list of Best 20 3D Street Arts of all times. Enjoy and get inspired! “Special Delivery” was created by Melanie Stimmell for the FringeMK Festival in Milton Keynes, UK in June 2011. Stimmell was the only U.S based artist invited to the festival to show off her incredible “Renaissance Style” art. 3d chalk art street painting by Tracy Lee Stum; created for the Youth in Arts Street Painting Festival 2008. This “Interactive 3D Picture” was painted by Manfred Stader at a shopping centre in Gdansk, Poland in June 2011 and creates the 3D illusion with both horizontal and vertical pieces combines to add further depth to the trick of the eye. 3d chalk art street painting. Veteran 3D street painter, Julian Beever made a surprise late appearance in December of this year with his “Santas Grotto” picture in Camberley, UK. Beever is one of the most famous and well known 3D street art painters and he took 4 days to create this piece in chalk. Sidewalk Chalk Art,also called 3D graffiti, whether it’s in chalk or paint, on walls or the street, represents a new way of combining the mastery of Renaissance art techniques with the gritty, ephemeral qualities of amazing street art. “Wunderful Life” by Street Advertising Services. The team at SAS created this wall and floor piece which measured 100 square metres in London. Unusually for 3D street art, the picture was completed with aerosol paint and is reputed to be the worlds first photo-realistic 3D graffiti. Edgar Muller, who is probably the third most popular 3D street artist (Kurt Wenner and Julian Beever are 1st and 2nd) created this amazing picture in Michigan, USA. Titled ‘Phoenix’ by Muller. The picture was created for the City Art Gallery in August 2011 and drew crowds of people over a week who posed for photographs with the artwork. Lego Terracotta Army created by Planet Street Painting for the Sarasota Chalk Festival in November 2011. The piece won best 3D piece of the festival and publicity for the picture was created by a giant Lego man washing up on the beach before the festival began. The VisitBritain Tour by Joe Hill. 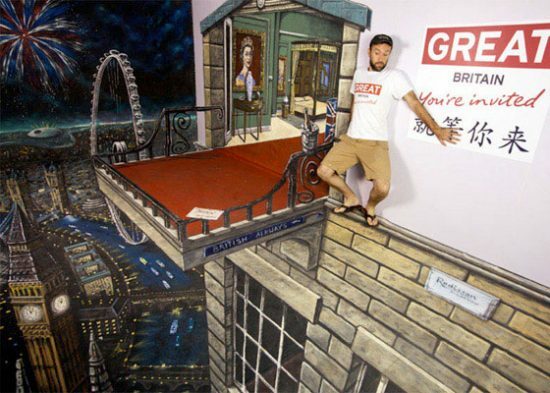 British Artist Joe, toured several countries around the world creating attention with for famous UK landmarks and events with his 3D artwork. This particular piece was shown in Shanghai, China and was created with the art being painted on two walls and the floor. Joe Hill also created this stunning piece at the London Docklands for Reebok Crossfit. The piece took a week to create and was 106.5m long and broke the World Guinness record for being the longest anamorphic picture. Unfortunately, the record only stood for a month, because on December the 6th 2011 Chinese artist Qi Xinghua broke the record, again. Qi Xinghua broke the record with his piece in Macau, China. The picture was 120m long and was created to celebrate the second anniversary of the Central Shopping Centre in Macau. It is the second time Xinghua has held the record for having the longest anamorphic picture and I look forward to seeing if his record holds in 2012. Photoshop – All Under One Hat!